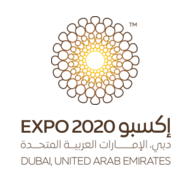 Al-Moltaka is the Arabic word for Gathering - a special Gathering of senior, high ranking members of the community normally held in the best Majlis - very apt for this Gathering of Senior Executives from the Construction Industry in Dubai. 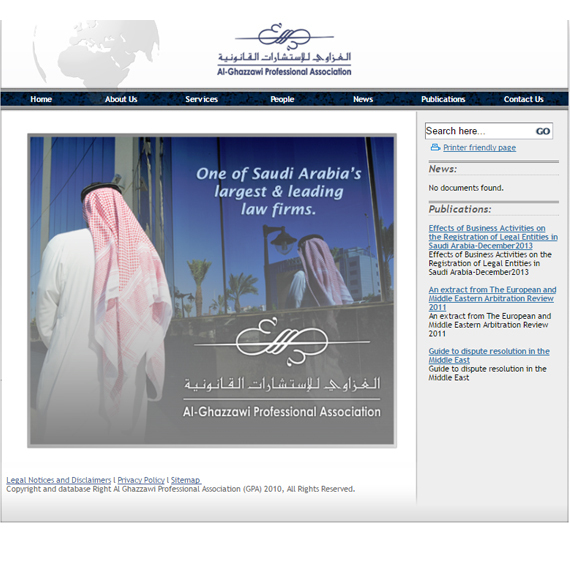 Al Ghazzawi Professional Association is a full-service firm with a strong international profile which has approximately 30 lawyers spread across offices in Jeddah, Riyadh & Dammam, GPA was established in 1969 by Dr. Talal Amin Al Ghazzawi, the current Chairman of GPA. Continuing with a heritage of high standards; combined with modern enthusiasm, Dr. Belal Al-Ghazzawi &Mr. Hussam Al-Ghazzawi joined as partners and elevated the Association into an internationally known full-fledged law firm. The Indian Association of Belait (IAB) was formally registered in 1948 and the Indian Association Building was firmed and constructed around 1950. 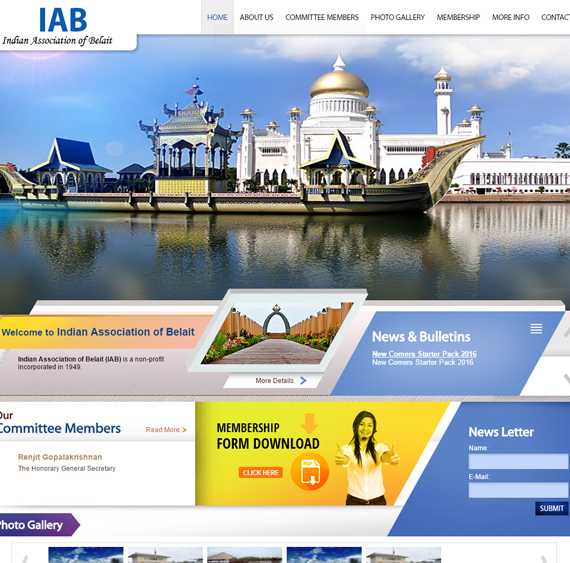 IAB is an association registered in Brunei for the Indians of Indian origin irrespective of which country they come from. The Indians came to Brunei from all walks of life. They contributed as tachers, doctors, engineers and others predominantly from construction. The place of Seria where the IAB is currently situated was a place full of swampy conditions. With the oil and gas making way for facilities development, the construction of facilities and building came to realisation. IAB was unique in the sense that from the idea to building its physical completion was carried out by Indians for the Indians. The Indians were from many part of India and also from Malaysia, Singapore, Srilanka. The building has a heritage of one of the very first permanent building to be built around that time. The buildig became a hive for the Indians to gather and mingle to learn from each others. The men, women and childern quickly established themselves and started the various events that till this day exists. Indian communities from all parts of India will contribute their cultural heritage along with the food delcacies within the IAB. Till this day, the exchange of ideas and culture within the communities exists and will continue. Through time immemorial, the building itself has continued to host variuos events ranging from marriage, festivals, cultural classes, language classes, musical and drama performances. It was a well-known fact that large number of Indians residing in Belait District were predominantly local Brunei ethnic Indians. Today this group of Indians have gone through cross marriages and has merged nicely with the Bruneian concept whist still maintaining the roots. This is further sustained with the ever growing form of engagenment of ethnic Indians with the expartriate Indians who are continuing to find employment in the abode of peace Brunei Darussalam. 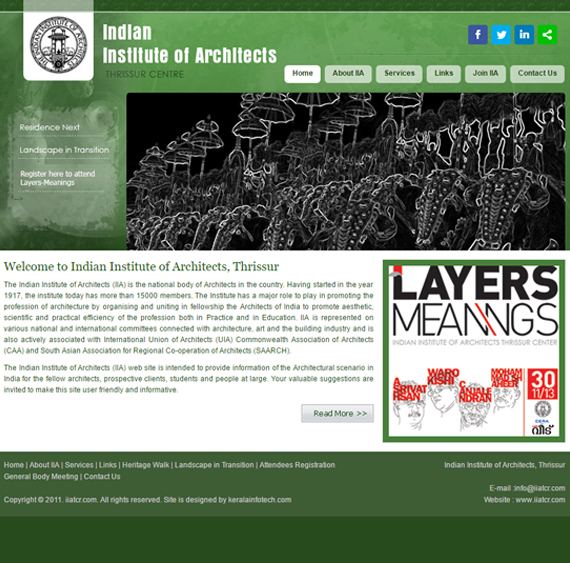 The Indian Institute of Architects (IIA) web site is intended to provide information of the Architectural scenario in India for the fellow architects, prospective clients, students and people at large. 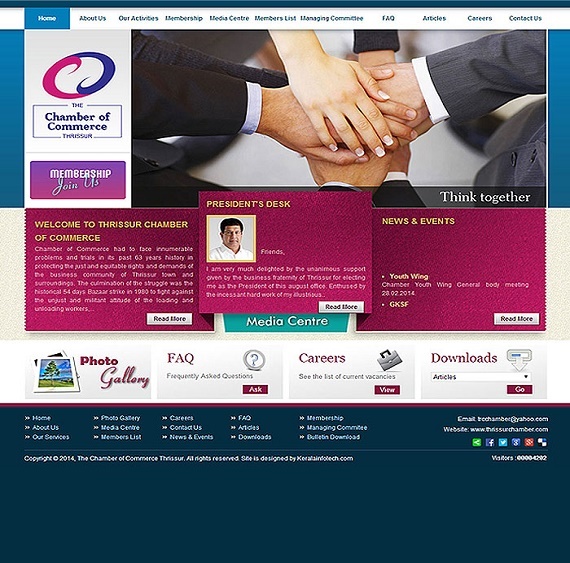 Your valuable suggestions are invited to make this site user friendly and informative. 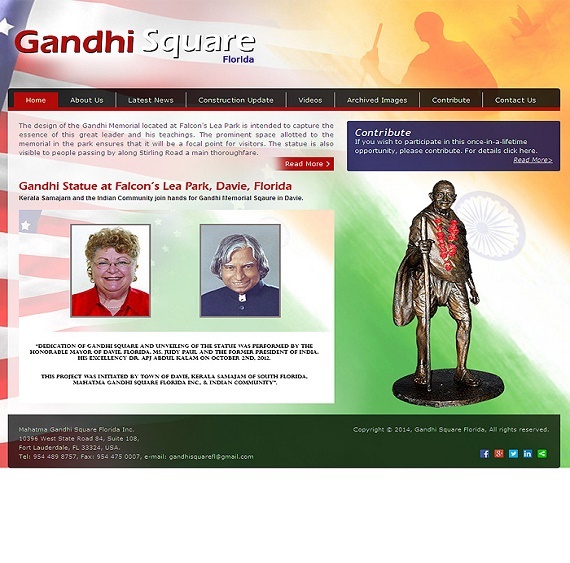 The design of the Gandhi Memorial located at Falcon’s Lea Park is intended to capture the essence of this great leader and his teachings. The prominent space allotted to the memorial in the park ensures that it will be a focal point for visitors. The statue is also visible to people passing by along Stirling Road a main thoroughfare. 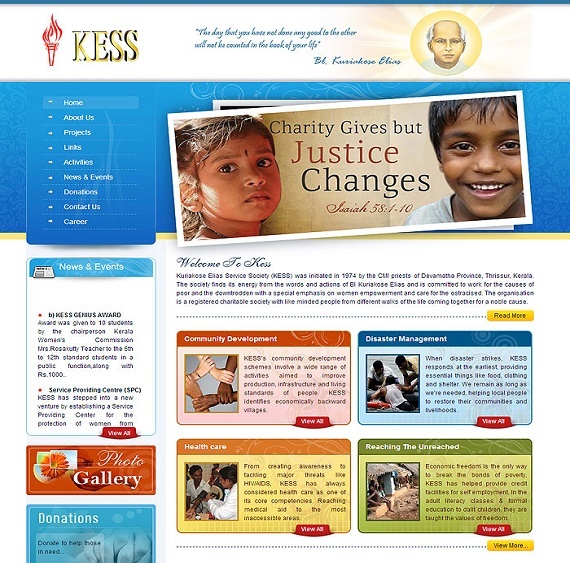 Kuriakose Elias Service Society (KESS) was initiated in 1974 by the CMI priests of Devamatha Province, Thrissur, Kerala. The society finds its energy from the words and actions of St. Kuriakose Elias and is committed to work for the causes of poor and the downtrodden with a special emphasis on women empowerment and care for the ostracised. 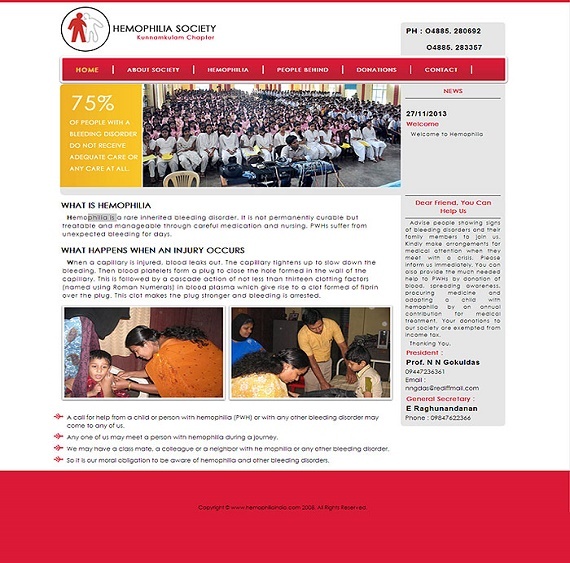 The organisation is a registered charitable society with like minded people from different walks of the life coming together for a noble cause. 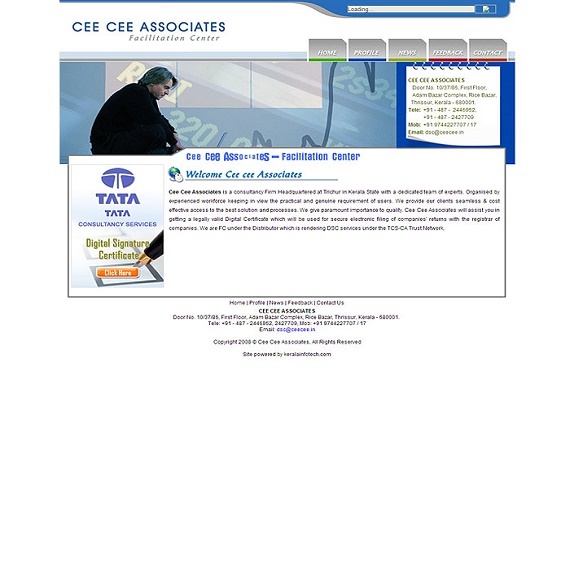 Cee Cee Associates is a consultancy Firm Headquartered at Trichur in Kerala State with a dedicated team of experts. 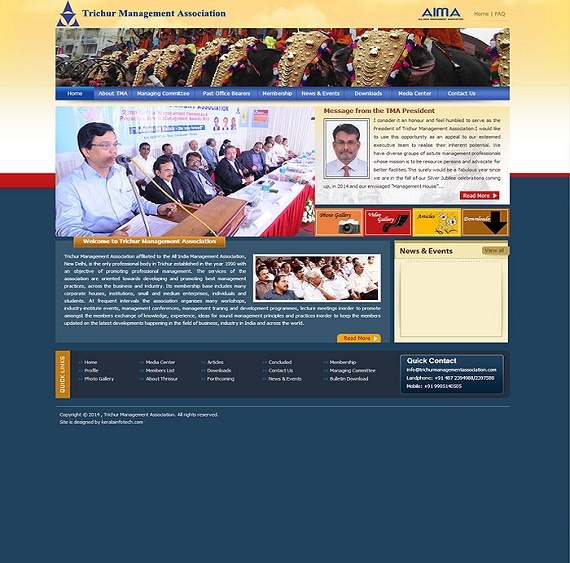 Organised by experienced workforce keeping in view the practical and genuine requirement of users. 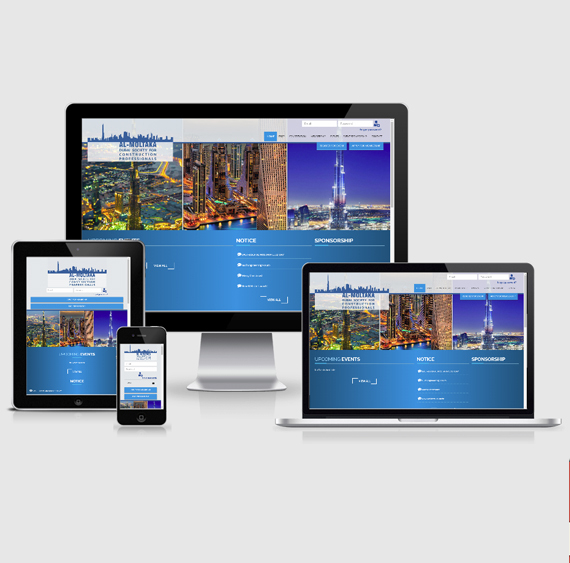 We provide our clients seamless & cost effective access to the best solution and processes. We give paramount importance to quality. Cee Cee Associates will assist you in getting a legally valid Digital Certificate which will be used for secure electronic filing of companies' returns with the registrar of companies. We are FC under the Distributor which is rendering DSC services under the TCS-CA Trust Network. 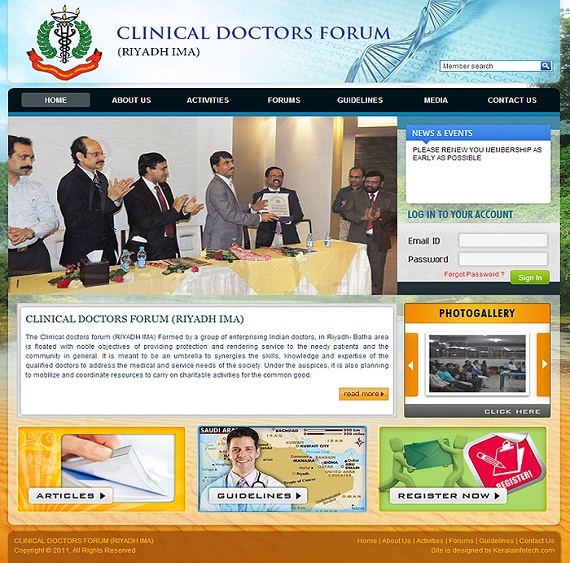 The Doctors clinical forum (RIYADH IMA) Formed by a group of enterprising Indian doctors, in Riyadh- Batha area is floated with noble objectives of providing protection and rendering service to the needy patients and the community in general. It is meant to be an umbrella to synergies the skills, knowledge and expertise of the qualified doctors to address the medical and service needs of the society. Under the auspices, it is also planning to mobilize and coordinate resources to carry on charitable activities for the common good. 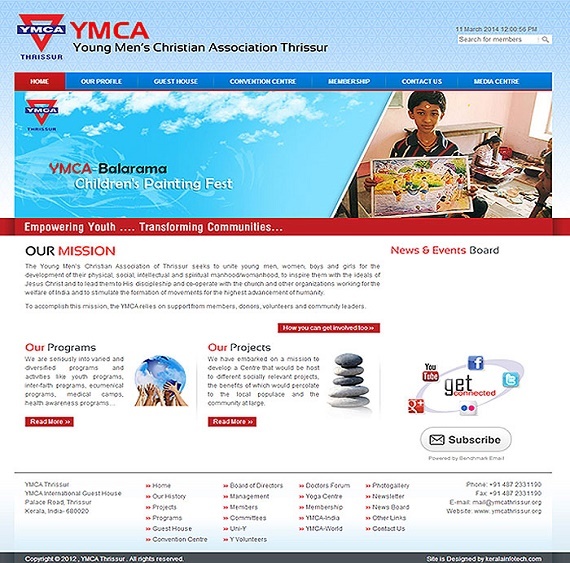 The Young Men’s Christian Association is a standing testimony to the power of true Christian values that transcends the narrow confines of geography, politics, colour, faith and language. A movement that was started in London by a 23 year old Englishman who felt that it was ‘the duty of Christian young men to witness in practical ways to their faith in the sphere of their daily life, had surpassed the expectations of its pioneers even during their life time. When Sir. George Williams and his friends planted the seeds of the YMCA in 1844 in London, would they have ever imagined that a few decades later, in 1886 and thousands of kilometers away, a small town named Thrissur in the small princely state of Cochin (remember Kerala was not formed until 1956) would have a YMCA of its own! It is even more interesting to know that Sir. George Williams died only in 1905, and the National Council of YMCAs of India was formed only in 1891. Truly, the YMCA of Thrissur has a history that is unique in many ways. Kerala has a long history of organized healthcare. As per documents, by the time the state was formed in 1956, the foundation for a medical care system accessible to all citizens was already laid. The easy accessibility and coverage of medical care facilities has played a dominant role in shaping the health status of Kerala. 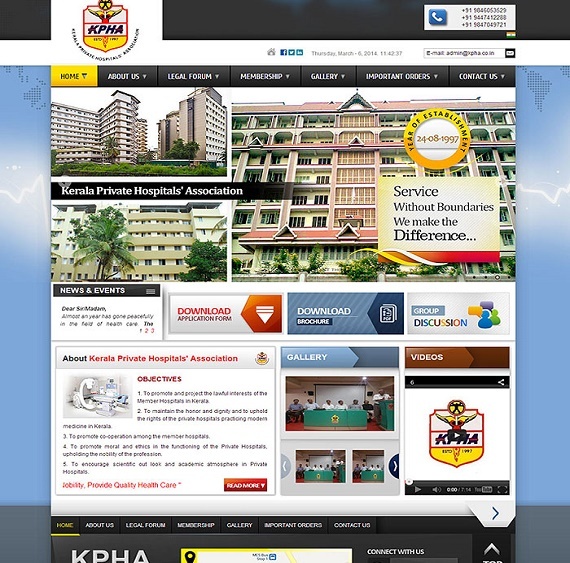 Some of the hospitals in Kerala are more than 50 years old. Health had been a major area of spending in the budget from early years in Kerala. 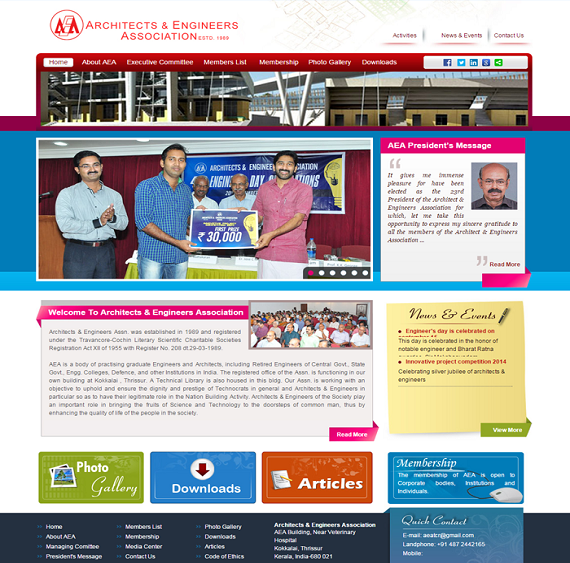 Architects & Engineers Assn. was established in 1989 and registered under the Travancore-Cochin Literary Scientific Charitable Societies Registration Act XII of 1955 with Register No. 208 dt.29-03-1989. AEA is a body of practising graduate Engineers and Architects, including Retired Engineers of Central Govt., State Govt., Engg. Colleges, Defence, and other Institutions in India. The registered office of the Assn. is functioning in our own building at Kokkalai , Thrissur. A Technical Library is also housed in this bldg. Our Assn. is working with an objective to uphold and ensure the dignity and prestige of Technocrats in general and Architects & Engineers in particular so as to have their legitimate role in the Nation Building Activity. 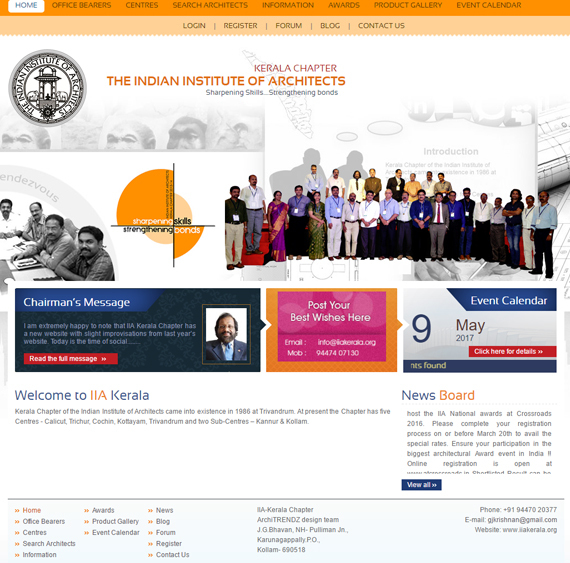 Kerala Chapter of the Indian Institute of Architects came into existence in 1986 at Trivandrum. At present the Chapter has five Centres - Calicut, Trichur, Cochin, Kottayam, Trivandrum and two Sub-Centres – Kannur & Kollam. 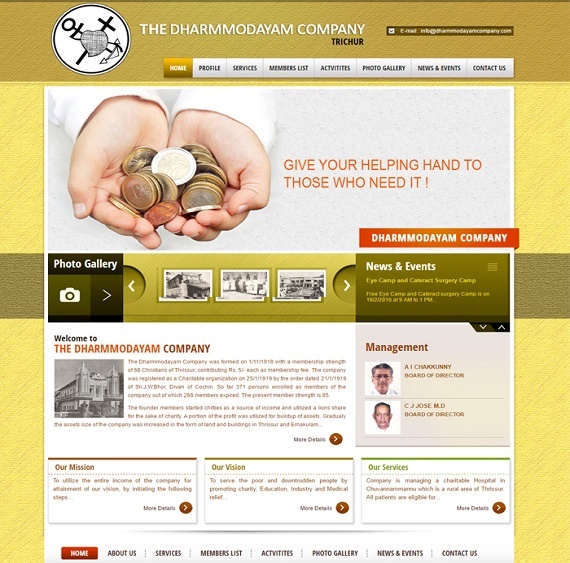 The Dharmmodayam Company was formed on 1/11/1918 with a membership strength of 68 Christians of Thrissur, contributing Rs. 5/- each as membership fee. The company was registered as a Charitable organization on 25/1/1919 by the order dated 21/1/1919 of Sri. J.W.Bhor, Divan of Cochin. So far 371 persons enrolled as members of the company out of which 286 members expired. The present member strength is 85. The founder members started chitties as a source of income and utilized a lions share for the sake of charity. A portion of the profit was utilized for buildup of assets. Gradually the assets size of the company was increased in the form of land and buildings in Thrissur and Ernakulam. Now the main source of income of the company is from rent. The company is also engaged in Agri activity by maintaining a Rubber Estate at Chuvannammannu, Near Pattikkad.